Many ask us if the products in our testimonials real stacked stone are. They are always quite surprised to find out that it is in fact faux stone in the form of panels. 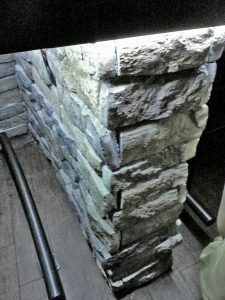 They also go on with asking how difficult it must have been to create that stacked stone look with panels of fake stone. 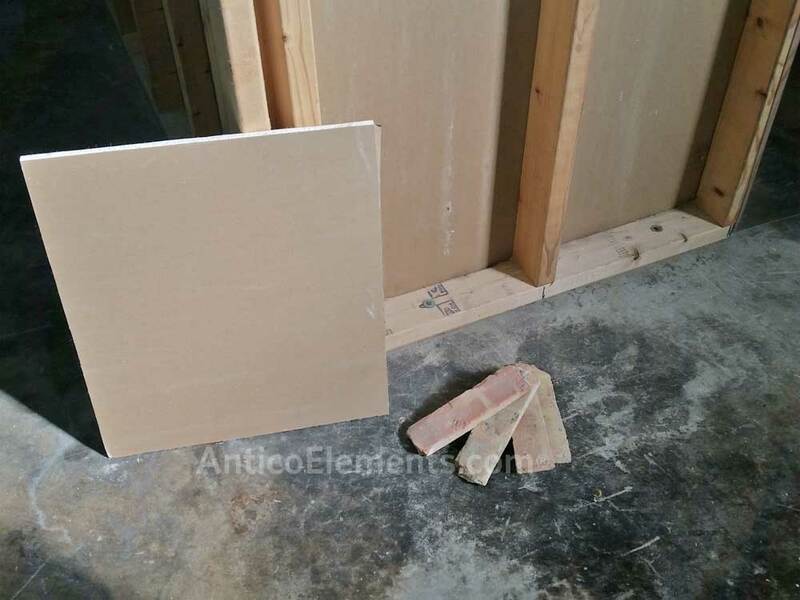 In reality, using Antico Element’s panel is a lot easier to make any plain drywall area look like a real stone wall, much easier than the so-called real stone. The reason we are a bit skeptical about using this term is because many do not know that what today is called real is just cast concrete, that comes out of the mods looking like real stone. Many decide to use cast stone with the hope their wall will look more real. 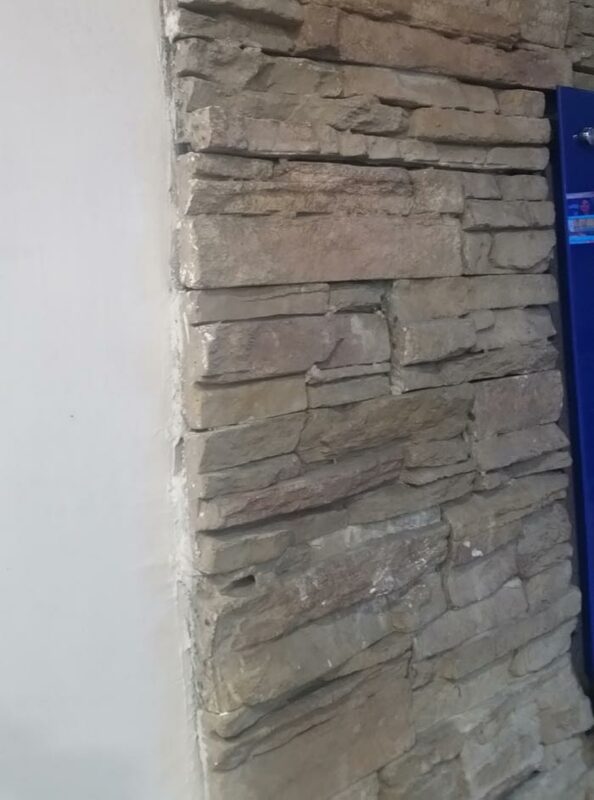 Even with the amount of work required to install cast stone they still can’t get the project to look real; all the joints and corners remain visible and often looking fake. So, how did Michael M. create his fireplace looking so rich? How did Richard and others make his staircase and fireplace look so real? Was it hard? They did a little research and asked us a couple of questions on how to cut faux stone panels and how to treat the edges. Ordered the panels online, received them with a paint kit and instructions on how to contact us in case he had some more questions. 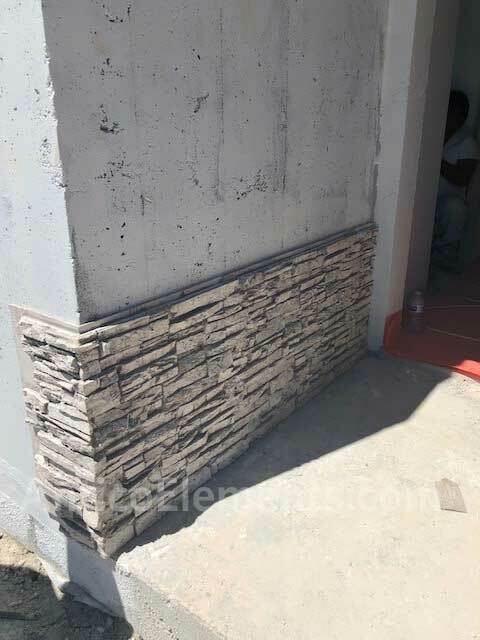 They made no preparation of the existing wall because these faux stacked stone sheets can be installed on virtually any surface; there was no need to go to your hardware store and get those heavy concrete backer-boards. They applied construction adhesive in the back of the panels and used a finish nail gun or screws to fasten them to the wall. Some of them were cut at 45 degrees to make turns and with the help of a table or circular saw, caulk and touch-up paint the corner transitions were made completely seamless. If we say these products are easy to use and shape it is because we always here these comments from our clients. Just give it a try, you will understand! Very often our great followers, clients and supporters ask us what the differences are between “real” stone or brick and the faux versions. Often, they include in the question a phrase like “how does your product compare to real stone and brick prices?”. The first thing we bring up is the difference between real and cast. Many of them are not aware of the difference between a stone that has been extracted from a quarry and a stone that has been cast with the use of concrete or even gypsum. This is an essential distinction because real stone is not affordable but cast stone is priced based on the durability and look. We have always had one goal in mind, provide a great product at a great price. Our brick and stone panels always look realistic because we start by crating molds from real products. 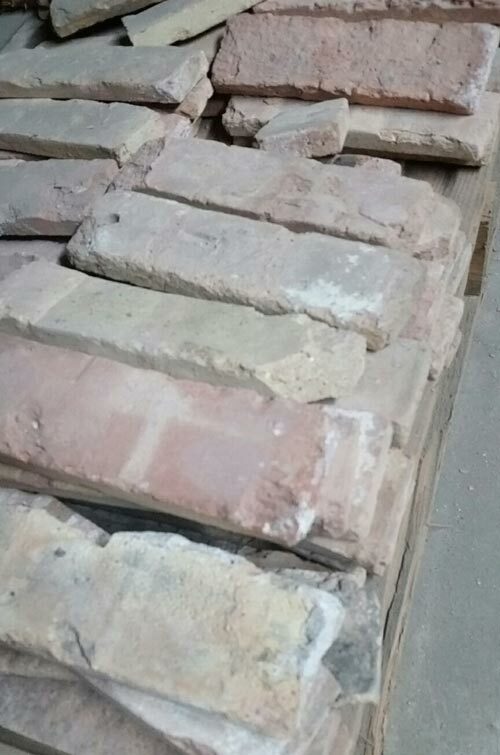 For example, in the image below you can see how we order real Chicago style reclaimed brick from demolished buildings. The parts that come out of our molds reproduce every detail of the original material. Many companies only resell products and some simply take some of ours and copy them, creating a second or third generation product. It shows! We manufacture our products in-house, so we control the quality. There are also other products used to compare to ours. Once we make our initial educational speech our customers feel a lot more informed and comfortable in making a decision. It is also true that many of them call us or come to our showroom with a smile in their faces and then say:” do you know how long we’ve been looking for a product like yours?? ”. For those who need a realistic-looking brick or stone accent, at an affordable price point, we are here to answer any question. Who says you need to spend a fortune to create a kitchen backsplash that looks like a million dollar? The conventional belief is that it is necessary to spend a ton to create a realistic and rich brick wall, for interior or exterior. Using expensive, real brick for any project can surely add up to a large bill. 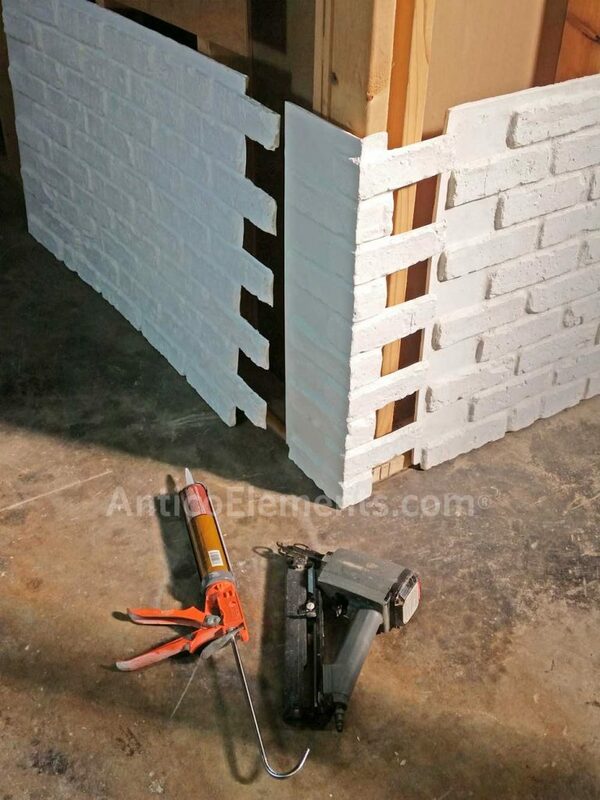 Most people believe this is the only way you can create a brick wall that looks like the real thing. Needless to say, many things have changed in the past twenty years. A lot of products have been created that make projects such a kitchen backsplash or a store backdrop a breeze. We constantly hear installers say they were hesitant at first. 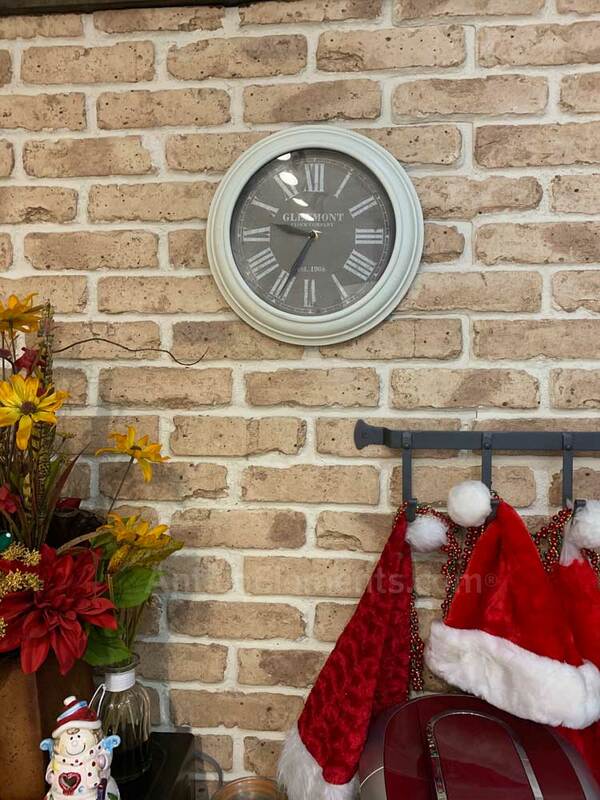 They were quite skeptical in switching from real brick to faux brick but then, after trying the new product, they vouch not to go back to the old brick types. 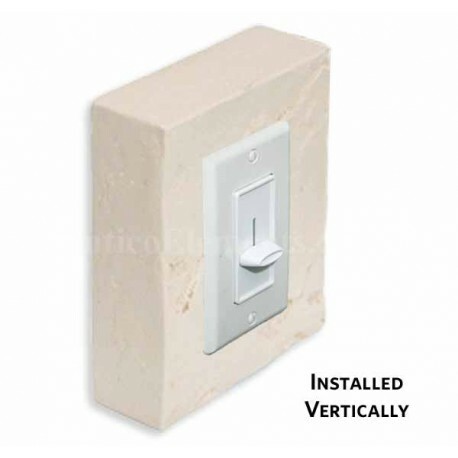 There are many reasons why this faux product amazes homeowners and installers alike. For one, the overall cost is a fraction of that of regular brick. 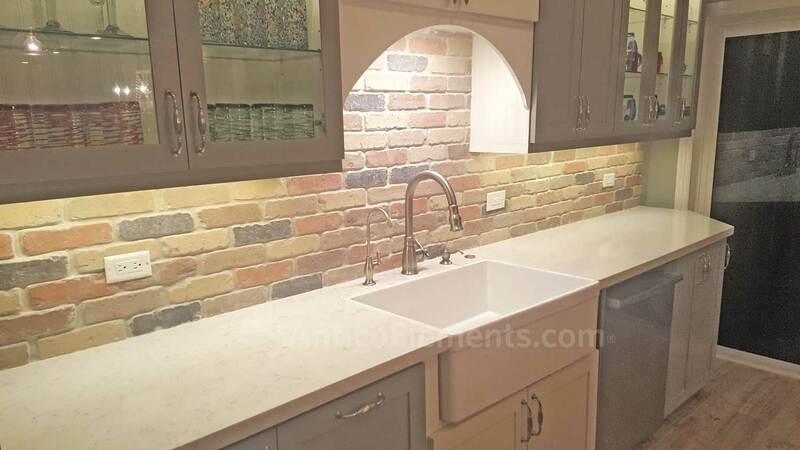 Faux brick panels may seem expensive but when you factor in the rest of the costs you will soon see the benefits. Any person can embark in this type of project, without the need to hire a brick layer. 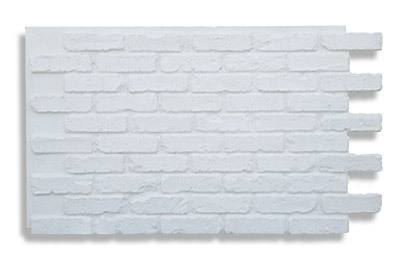 Faux brick sheets are made of a product that repels food stains so if is very easy to clean. This product is now being used in very many types of projects. You can find them in homes, office, groceries stores and many bars. It is also used in many trade show displays. It’s not just the convenience of installation but also the savings in shipping it. Being such a lightweight product the cost of shipping it is greatly reduced. 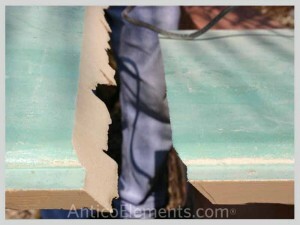 There is not mess left in the home since this product does not require a wet saw or mortar! Go ahead, be another installer who will say “no more real brick”. When Faux Brick And Stone Panels Are Made With Quality. It is safe to say that during every project, whether it for residential or commercial, the installer appreciates the quality of the product and the ease of use. 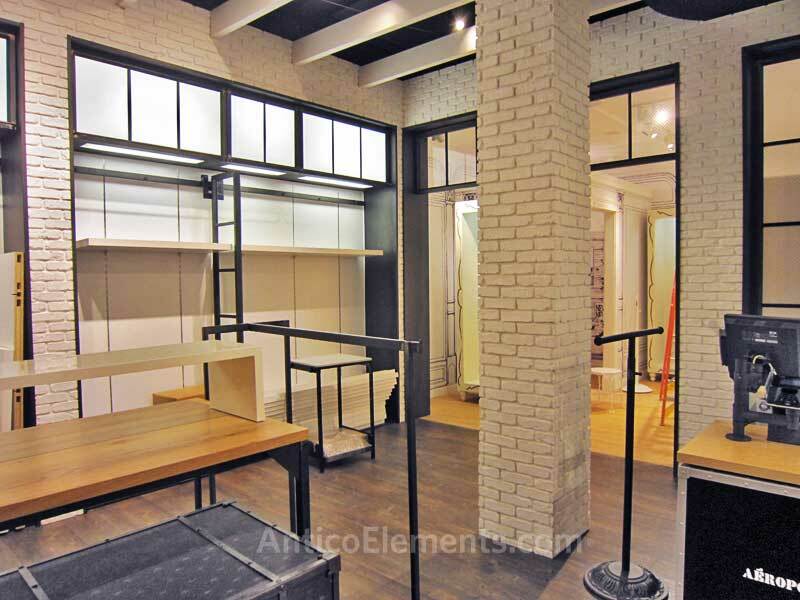 At Antico Elements we never lose track of what is important to the installers and designs. 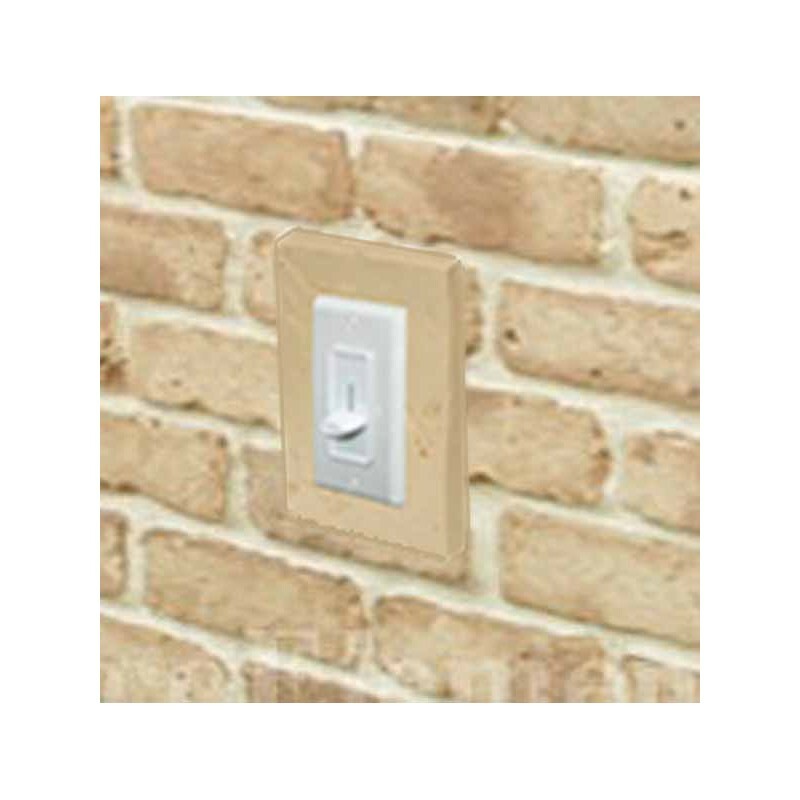 The last thing an installer needs is an issue with the quality of brick panels or how hard they are to install. 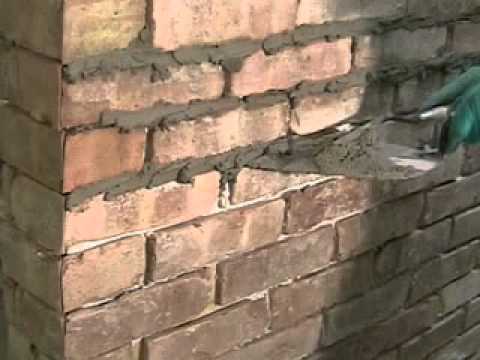 Back when real brick and stone were the only option, the mason would just be used to the time it took to create a wall. Today, after testing and appreciating the value of faux brick paneling, most installer will not go back and use real brick. Let's say you need to design and create a TV show's set and background. Let's also imagine that you need a light-weight set that can be moved to make room of the next show. You really can't use real stone (or cast stone) or real brick. In the video below from our great supporters within the Dude Perfect team you can see how real materials would never work in that set. You could also use some pressed board or vinyl panels but, the quality is clearly not up to par with polyurethane molded panels. 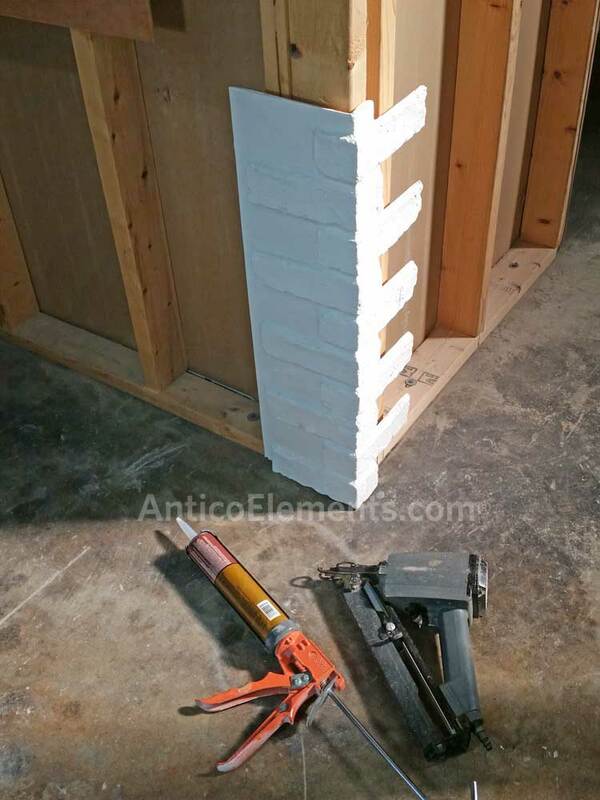 The molds are created from a real brick panels. This original panel is made of real reclaimed bricks from a demolished building so the molds that results from it will reproduce an exact replica of the original. If you add the way we paint each brick one by one, by hand, you really can't compare the quality to any other faux product. Let's not forget about maintenance and removal. Real brick is porous and it will absorb any stain. With acrylic-painted imitation panels the wall will be waterproof and super easy to clean. 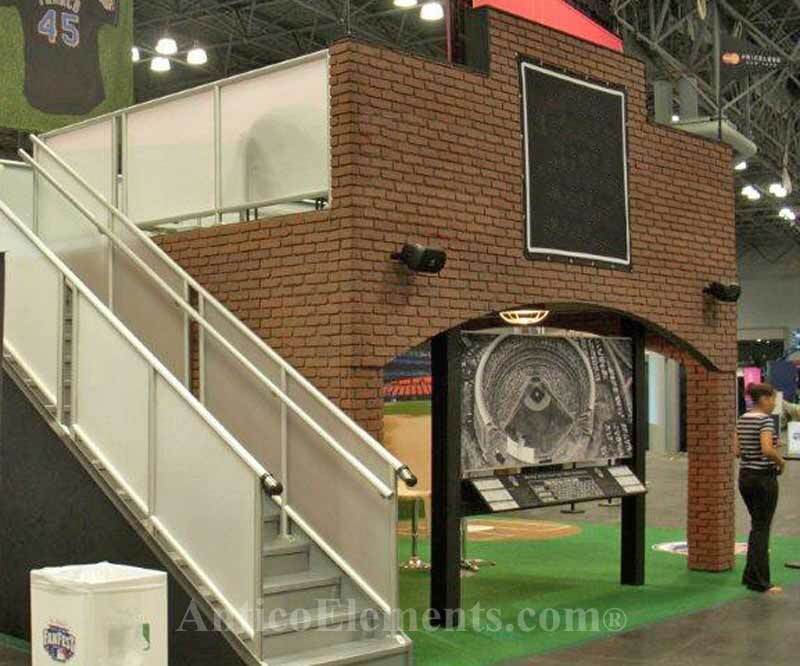 In many cases these sets or trade show booths are taken down and reused somewhere else. If you install the panels with screws, you can easily take them down and reuse many times. We have perfected the custom products manufacturing so, if you have a specific color and texture in mind, we can easily create a new product. You may click HERE to use our contact page. 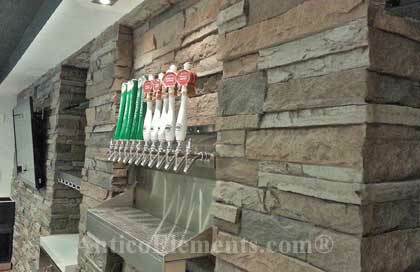 Wall Brick And Stone Panels Help TV Set Designs And Retail Stores Designs. We are often approached by designers who have spent countless time trying to create a backdrop for a retail store or TV talk show set that incorporates a brick or stone accent. 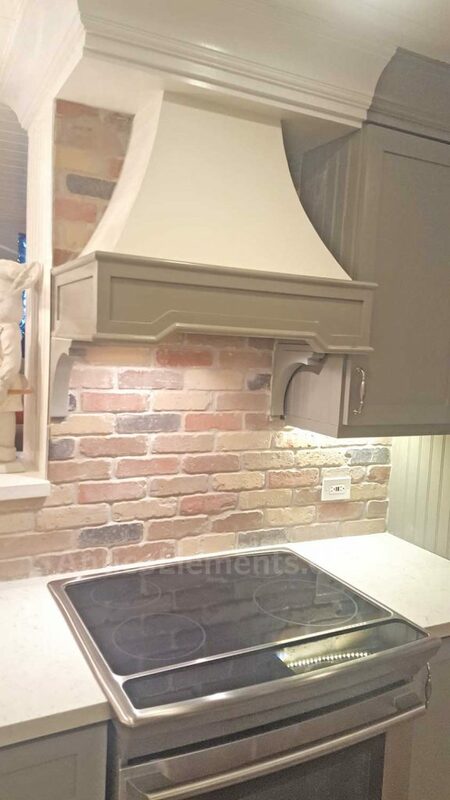 They confess to us that it would have been much easier to install brick or stone panels instead of trying to use real brick and stone, or even worse, trying to faux paint that look. 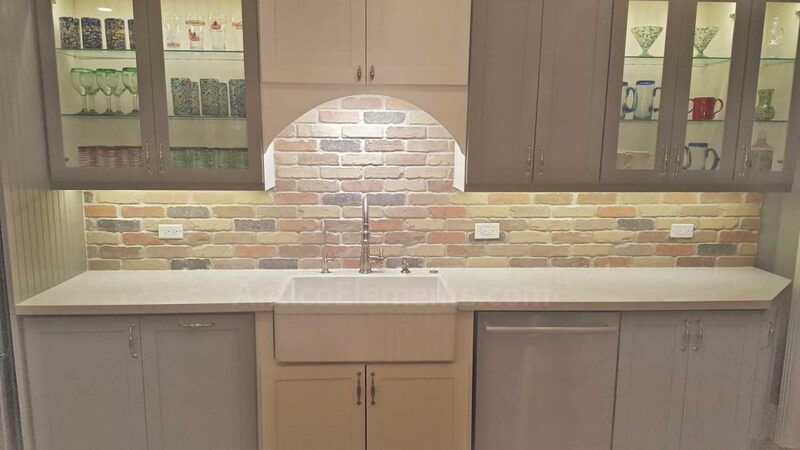 One of the challenges in our market is to let store outfitters, display booth designers and many other know that faux stone and brick panels exist. Once they find out they usually incorporate them in the design and drastically reduce the time it takes to design and build a project. Stages look incredibly better with stage lighting pointing directly to the stone panels from above. You can't create the same feel by using wallpaper or faux painted bricks. Selling the panels is for us just part of our focus. 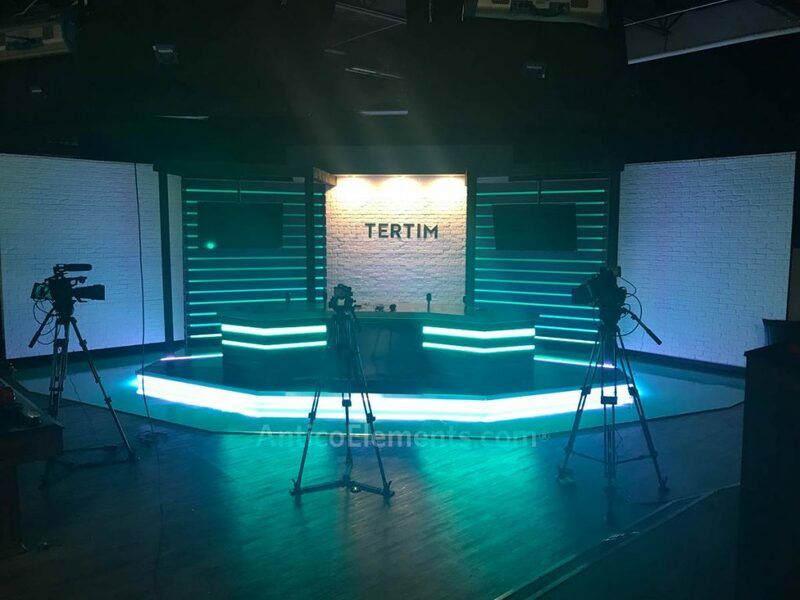 We focus on helping broadcast professionals and trade show booth designers in creating outstanding design that meet the needed time frame and budgets. We can create custom products, panels with different sizes and textures as well as custom colors. 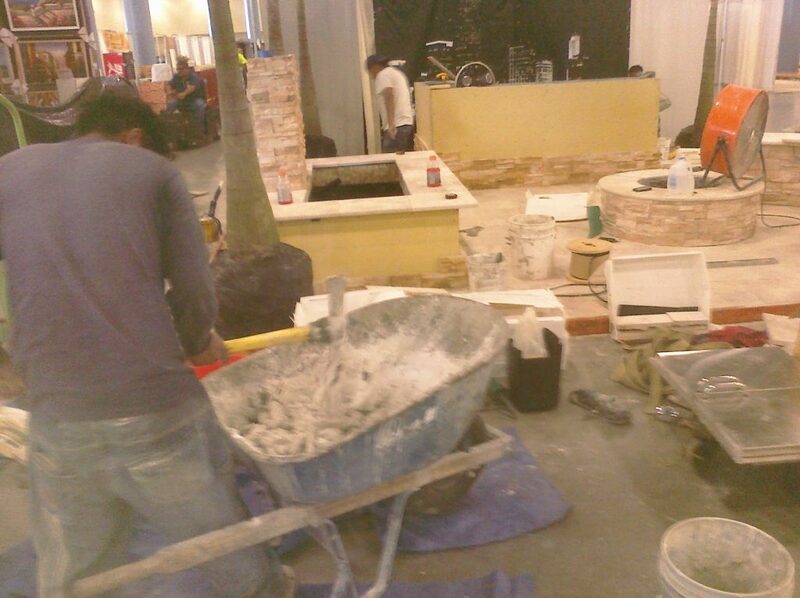 If you are in the trade show business you have probably seen how long it takes to install reals stone and real brick and how long it takes to take the booth down. All that work is also employed for just one show. 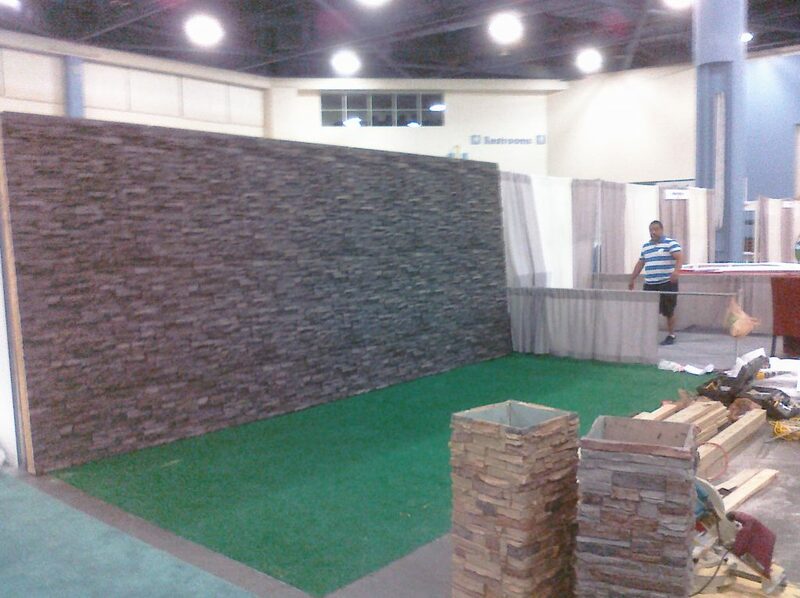 When using panels you can install the booth in hours but most of all, your clients can reuse the panels. All you need to install them is either use screws or even velcro. All of the materials can be reused many time, with a considerable saving. Stores and booths should be designed to get customer's attention, not just create a place to hang your products. Spending a few extra dollar per square foot provides and incredible ROI for the designers and the final client. Holidays Discounts With Clearance Items And Items In Stock At A Reduced Price. 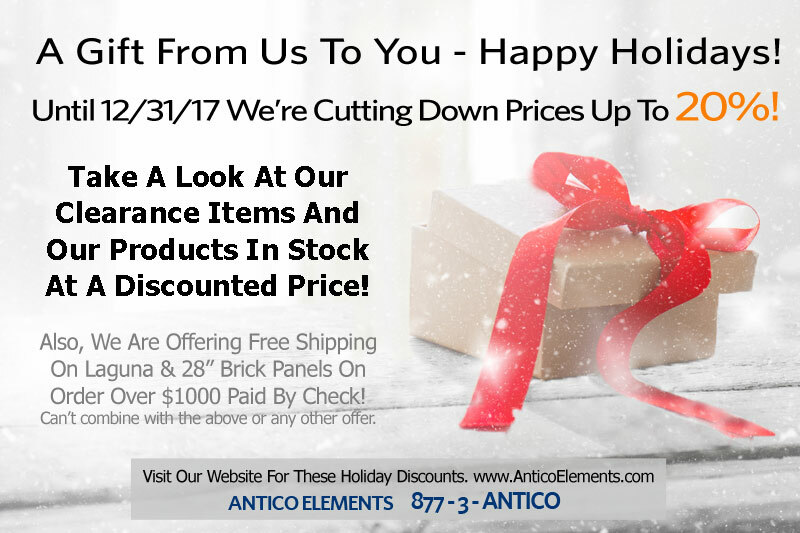 We want to thank our great customers by offering some end-of-year discounts. Until Dec 31 2017 you will see THIS page showing our clearance items. We are also offering products in stock at a reduced price, even being on sale already. Without any doubt our society is moving from an environment where construction and building things in general were done is a meticulous way. People used to take a lot of time to do things right and that used to be the norm in the construction business as well. Today every commercial and most residential project is based on how quickly they can be turned around. When it comes to builders and, store outfitters and display makers the speed of getting things done can mean the difference between being profitable, break even or lose money. 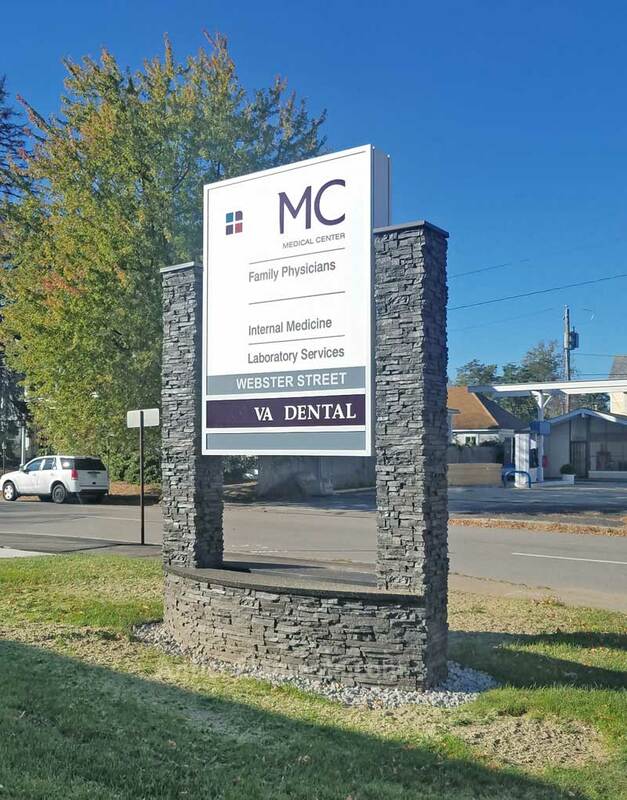 Sign with rounded faux stone that curved with the sign. 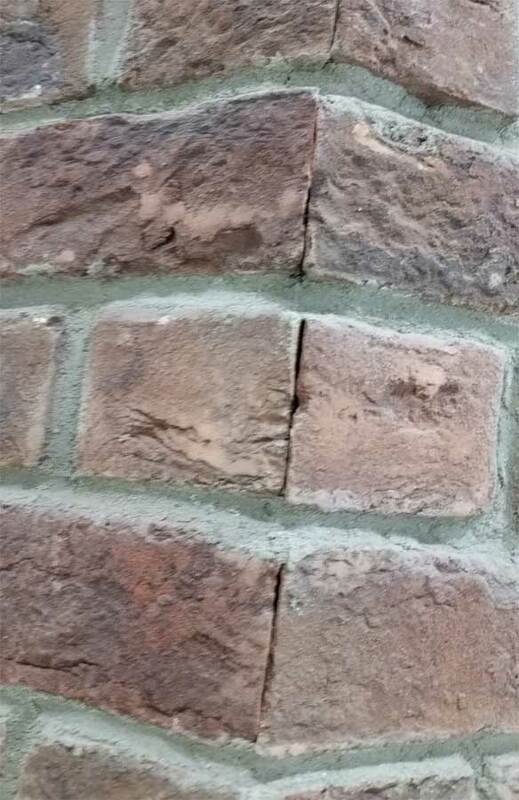 Brick and stone have been around for ever and the way they are applied hasn’t changed much. They still need a lot of preparation of the substrate and areas where they will be applied. 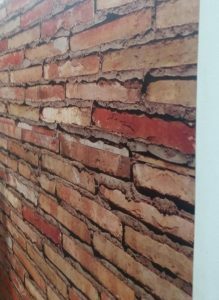 In the presence of project that require covering complicated wall shapes or signs real brick and stone will require a lot of custom cuts and the joints will be very visible. The majority of builders and contractors has now shifted to paneling of fake stones and fake bricks to complete their projects and to make difficult applications possible. 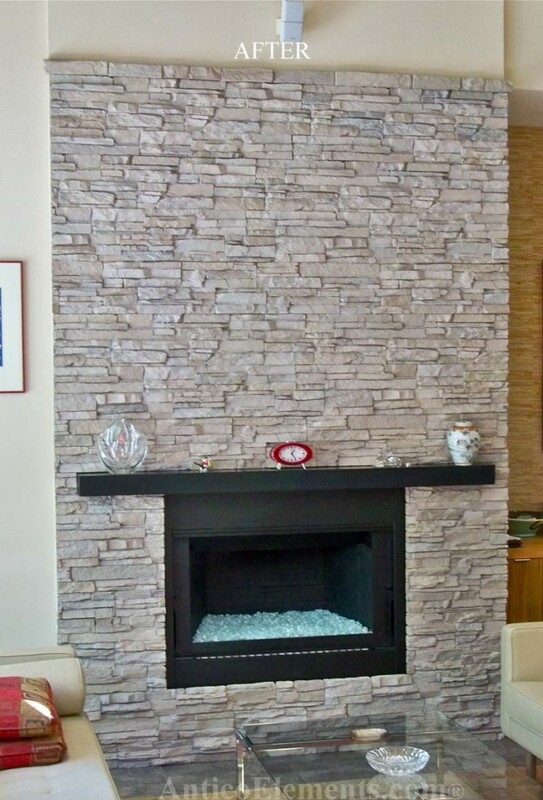 It can be challenging to entertain the possibility than an new fake panel of stone can be better than the real thing, particularly when one has used the real product for decades. 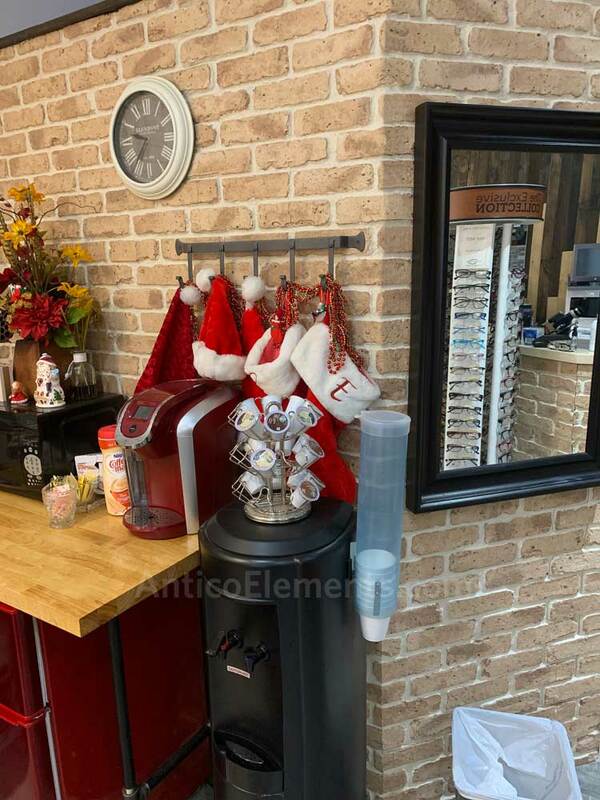 We learned that, once the installer has been educated on the benefits and has had the chance to try the product, they will use the faux version for all future projects. These rock panels can wrap around curved surfaces without leaving gaps at the joints. They also can be miter-cut to create corners and a very simple touch-up kit can be used to paint over any caulked area, to create e real seamless look. The other advantage is that there is no need to use mortar. 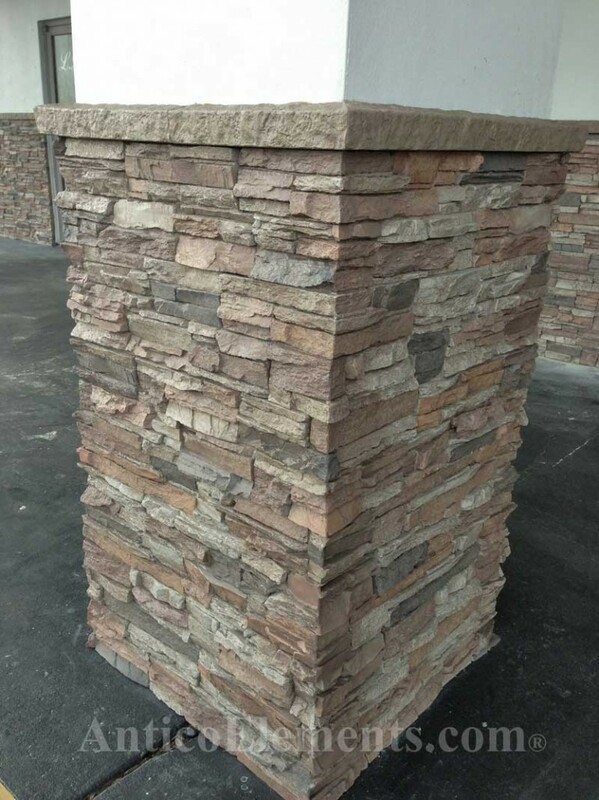 These “mortarless” rock and brick panels have been already treated in the factory so they are sealed and painted with exterior acrylic coloring that require no additional work. We realized that today most people involved in remodeling or construction in general can find a real benefit in using faux products and complete their projects within the necessary time-frame. One of the challenges of the imitation stone sheets is to organize and line up the panels so that the joints between two of them lines up with a framing stud. 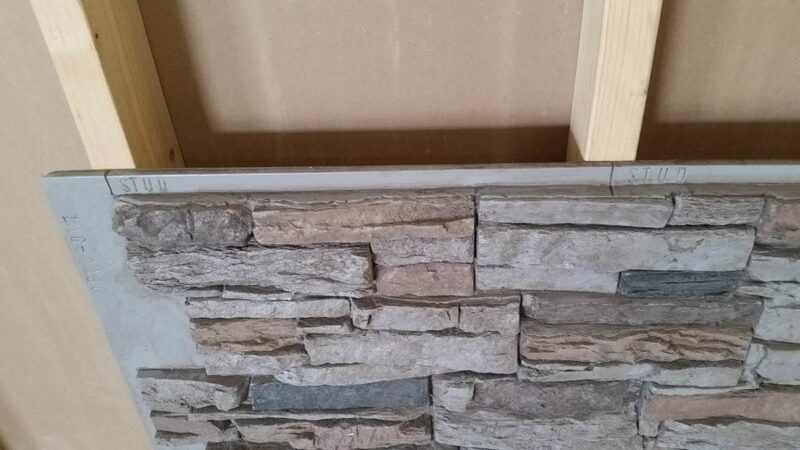 When installing faux stone panels you will have two staggered and interlocking edges that will slide into each other. The ideal installation would have the installer drive screws right where two panels overlap. If you have ordered panels that are not designed to line up with the studs then some of the these screws will hit a stud, some will just go into the drywall and not provide you with a sturdy bond. With the new Laguna stacked stone panels this issue doesn’t exist. These new panels have been engineered to always have the joints fall on a stud; given that the installation is started correctly. To start the process correctly all you need to do is alight the first panel of each row properly and the rest of the panels will line up automatically. 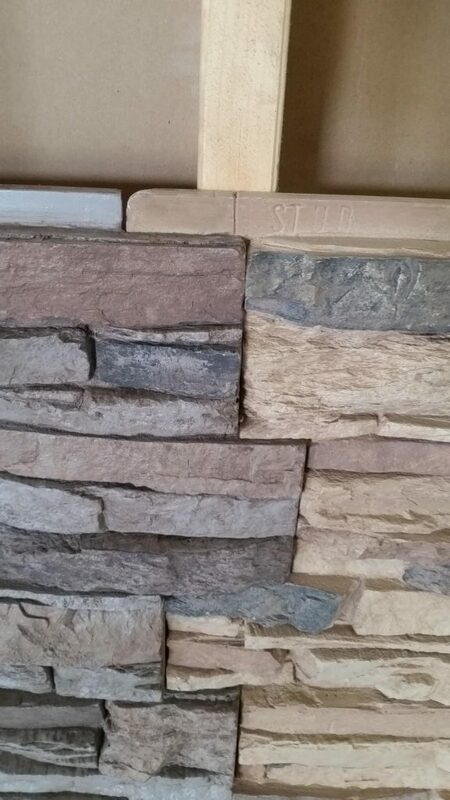 As you can see in the images the Laguna faux stacked stone has lines embedded in the panels and with the word “stud” next to them. These new panels need to be installed from right to left and bottom to top. The product drawing of these stone panels will also show you where to drive the screws within the panels’ surface. We also suggest using a construction adhesive where the panels overlap and in the back. It has never been easier to create a stone or brick wall look for less money and in a very short time. In short, the difficult work has already being done. All the installer has to do is line up the first panel correctly and the rest of the work will be completed without any effort. Of course sometimes the studs are not installed at the correct intervals but this should just be be a temporary issues. After the next panels is installed the studs should start lining up again. You may click HERE to view the Laguna line. 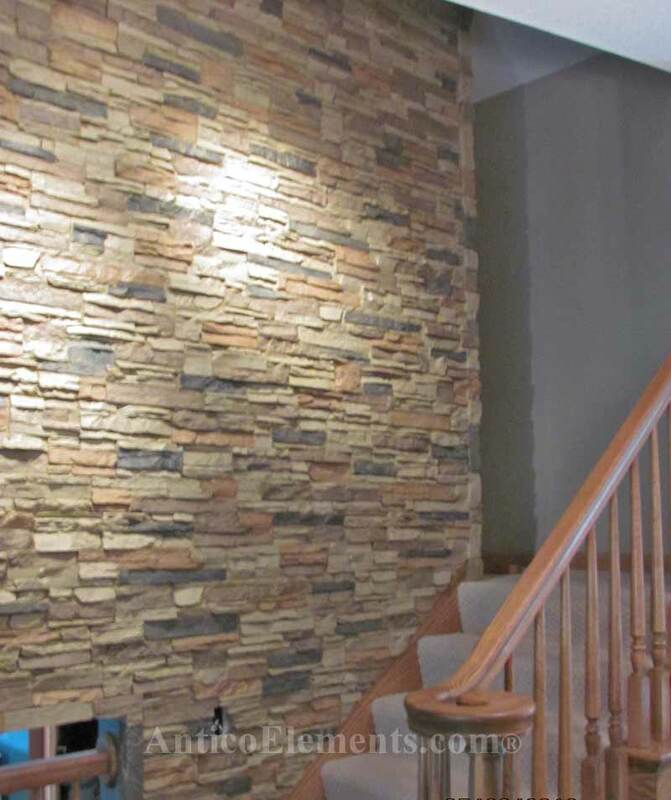 Faux Stone is one of the most versatile products to hit the home improvement market. Cutting faux stone is simple and easy to do. Unlike stone cutting saws there is no need for expensive diamond blades, create messy dust or use water. The polyurethane is durable yet light enough to allow for an easy cut with any saw. The table saw ensures the straightest and highest quality cut but any saw with a steady hand or a straight edge. If you look in your garage or your toolbox and do not find one do not worry you will still be able to use any other kind of saw such as a jigsaw or circular saw in order to finish your project. If you do not have any equipment at all then go to the nearest home improvement store and simply rent one. This will still be cheaper than any other method in the long run; like using real stone or hiring a mason. The main thing you should be focused on while doing your project is the proper preparation. Make sure the area is flat and devoid of bumps and other blemishes. Lay out the panels around the installation area to plan which panel to cut and where to create corners and returns. Do not fret because this only takes minutes. Some problems that arise while cutting is when people have pipes or fixtures and they need to put stone around it, which highlights the beauty and ease of faux stone. You may cut anywhere to fit your needs. After you receive a panel you simply face it where you want and draw out the line where you need to cut in order to fit the piping. If you run into any problems such as having too much or little of a panel the large assortment of finished edges will fit to your needs thereby giving you the customized look and professional finished result when you are done with your project. Here is a great example of the finished product after the corners and correct cuttings have been made. Unlike other products, like cast stone, you can easily miter-cut the panels and create seamless joint. You can see how natural products are difficult to miter-cut and create a clean look. The material is very forgiving and you can cover any gap with caulking and using out touch-up kit to paint over it for a joint that will be very difficult to see. Once you have established the exact area you need to cover draw out where the panels will go. Then apply how many you will need according to your design. Triple check your measurements and then confirm with the actual panels where you want them to go. Make sure to do the cutting as you go. Do not start cutting right away or else you will not be able to keep a continuous flow of pattern. An example of an important cut is the miter cut which is used on the corners of columns or end of walls. The goal is to stack the panels properly cutting off the edges in order to place them in a pattern. The edge that you cut off is not waster, you can use it to start then next row onto the level right above it and interlocks them into place that is why it is important to do your cutting as you go along. A great place to find a picture step guide is on anticoelements.com/installation. So keep your saw and marker handy. Always, use your tape measure in order to ensure you are cutting off the right pieces. In order to ensure a professional look make sure edges are cut straight. Be safe and have fun with your next home transformation project.